(Photo credit: Naoka Fakuda) By Dan Ambrose: Undefeated #1 WBC ranked junior middleweight contender Vanes Martirosyan (32-0, 20 KO’s) could finally be getting a big fight after seven years of beating 2nd and 3rd tier opposition to build up a hugely inflated record of 32-0. The 25-year-old Martirosyan has a good chance of either facing the winner of the March 24th clash between James Kirkland (30-1, 27 KO’s) vs. Carlos Molina (19-4-2, 6 KO’s) or take on IBF junior middleweight champion Cornelius Bundradge (31-4, 18 KO’s). The better fight in terms of gaining respect from boxing fans would be for Martirosyan to fight the Kirkland-Molina winner because it would be a fight that would draw a great deal of interest, especially if it turns out that Kirkland is the winner of the Molina-Kirkland fight. 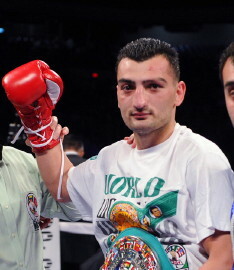 Also, a win over Kirkland or Molina will make Martirosyan the mandatory challenger for World Boxing Council junior middleweight champion Saul Alvarez, and that would be the biggest of them all because both Alvarez and Martirosyan are unbeaten, and a lot of boxing fans would want to see that fight. However, Martirosyan may have problems getting past Kirkland because he’s got a lot of power and puts a ton of pressure on his opponents. Martirosyan has been matched against mostly soft opposition his entire career and when he moved a little in his fight against Kassim Ouma a couple of years ago in 2010, Martirosyan struggled to a controversial 10 round decision. Kirkland is a bigger puncher than Ouma and throws a lot more punches than him as well. Martirosyan might find himself in a situation where he would literally need to run for his life to escape the pressure and I’m not so sure that he can win a fight by running against someone like Kirkland. Martirosyan easily beat 41-year-old Troy Lowry by a 3rd round TKO last Saturday night on the undercard of the Julio Cesar Chavez Jr. card at the Alamodome in San Antonio, Texas. This was a fight where Martirosyan might have been better off not taking but he’s not the one that makes the fight.